Our favorite is Portent! 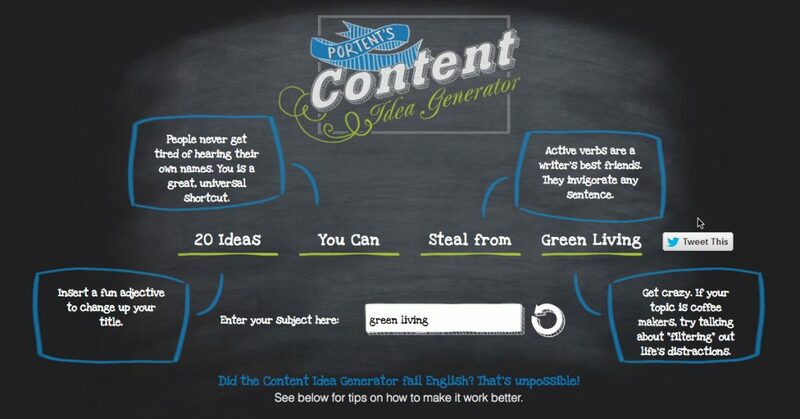 I use Portent to spark ideas and stimulate my creative juices. Some of the phrasing makes me laugh, that alone makes me realize a headline that makes a reader laugh is more memorable and more likely for a user to take action. Content Idea Generator … nouns); Use the singular version of your keyword; Revise the result to create your own fantastic (grammatically correct) headline. We love this tool form Hubspot. Do you have an overarching theme or keywords in mind for your next blog post, but you’re not sure at which angle to tackle it? HubSpot’s Blog Topic Generator could come in handy. Simply type in three keywords, and the tool will auto-generate five potential topics for your post. If you’re not keen on the suggestions, you can always click “Try Again” and it’ll give you five more topics. The free blog post headline analyzer will score your overall headline quality and rate its ability to result in social shares, increased traffic, and SEO value.